Heavy machinery is amazing, and you can not deny this fact. When we were kids, we always admire the power of construction equipment and wish that we could operate or ride them. Even as an adult, it is very interesting to watch the excavators. But, in reality, we can not just jump and operate heavy construction equipment. 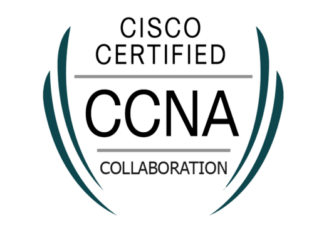 It requires long term training and the certification to operate the equipment. Some people like RC planes, boats or cars, but comparing them with heavy machinery equipment is useless. They can drive, fly and speed up quickly. But, are they able to carry things or dig any stuff? Well! The answer is no. 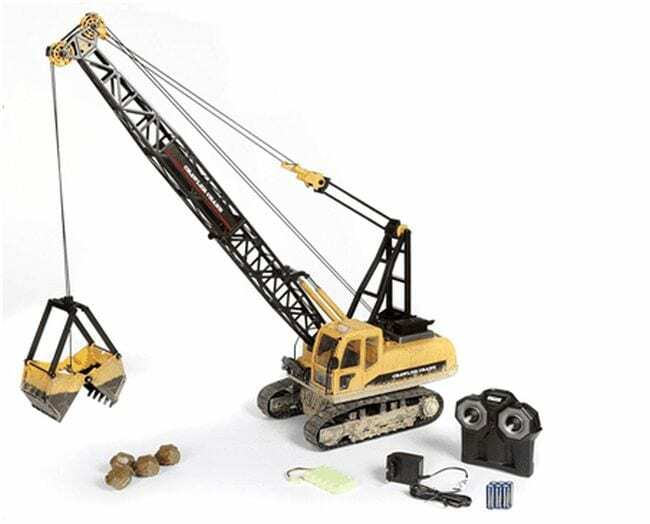 An amazing RC Construction Equipments can bring out the imagination of small builders. These equipment are not just a toy but a complete RC Equipment that you control using a remote device. It doesn’t matter which type of construction equipment you desire, there are various types of styles and options available for the remote controlled RC Equipment. One can make the perfect choice from the vast range of RC construction equipment like loaders, cement mixers, cranes, excavators, dump trucks and a lot more. 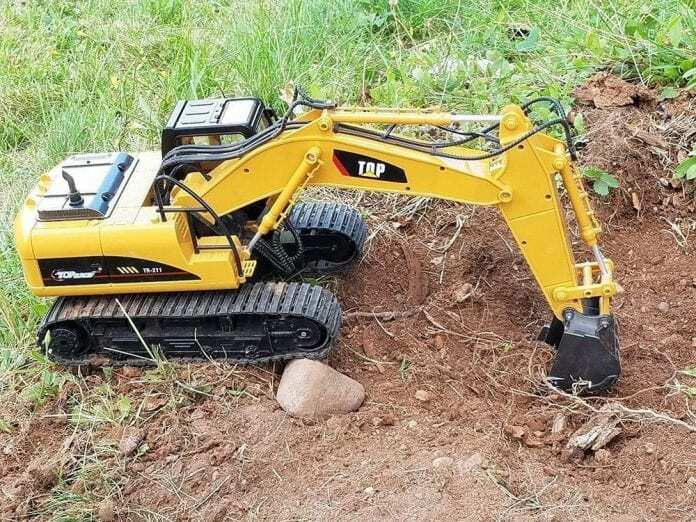 The realistic RC excavator is one of the fantastic RC construction equipment which is designed by the Toy Machine and works incredibly. Excavator supports 15 channel control, operates at 2.4 GHz signals and 680-degree rotation. As per the sales material, the bucket is quite strong and able to move easily to share an immersive experience of digging. It also has a hydraulic cylinder simulator through which machine is able to handle a stable excavation process in a completely realistic manner. The material of RC Excavator design by using high-quality material. And, the machine can be used for outdoor as well as indoor uses in sandboxes and to move small stones. It is made out of high-quality materials and is very detailed indeed. Why not use this machine for indoor and outdoor uses in sandboxes or for moving small stones. The RC excavator comes with a high-capacity rechargeable battery that brings you joy to know that you’ll always have more time to explore with you RC construction equipment. To know more about RC Excavator don’t shy away to click here. 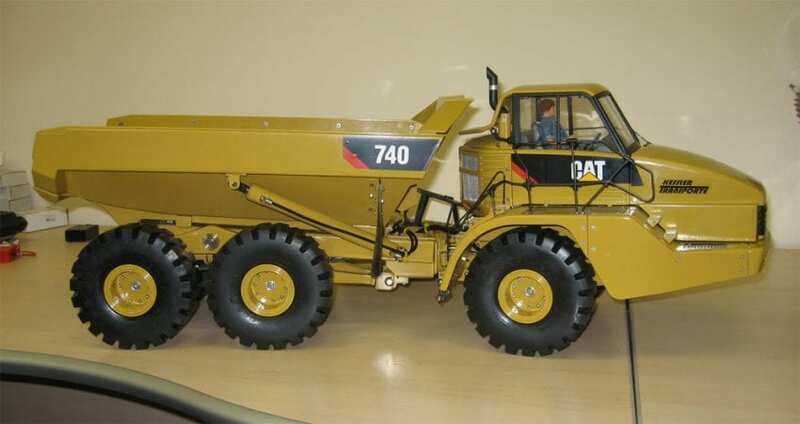 Now, here we have mining dump truck RC Caterpillar, this RC construction equipment is somewhat similar like Real Caterpillar 797 trucks used in mining. Also, this model holds a 1/24 scale replica, that means it is designed and painted just like the real one. Moreover, this RC Dump truck have various parts dedicated to different functions, and these parts can be controlled individually using the 2.4 GHz speed control. Also, it comes with multi-functional digital proportional radio and speed control to provide steering, forward and reverse motion. You’ll agree that this one is a heavy-duty RC dump truck, and it will give you an amazing playing experience to move and dump stuff. Along with it, there is 9V 200mA 1.8V charger for 4.8V 800mAh rechargeable battery; also it requires 6AA batteries. Even, it holds a two-channel transmitter. Your mini collection of construction RC Machine is incomplete without this little monster. The amazing Caterpillar Wheel Loader is an incredible machine to mock-up the digger mining recreation. The RC loader is perfect to use for kids as well as adults, and it can even provide you hours of amazing experience and that too without any interruption. This RC loader is the construction vehicle replica, and it also offers highly realistic operations to perform just like an industrial vehicle. All parts such as cab, wheel, and bucket are created using the hard metal with rubber tires. The RC Skid Steer is a 1/12 scale replica model of real CAT Skid Steer. The RC Skid Steer is a multi-functional electric powered equipment that every RC model collector must have. This RC model supports easy working and has an ultimate weathered finish. Also, it comes with a completely functional operating power arm and a battery charger. CAT RC wheel log loader is another RC construction equipment in the list. The little RC model holds 2.4 GHz speed control that comes along with forward and reverses movement. Also, it comes with right and left steering along with working headlights and rear lights. 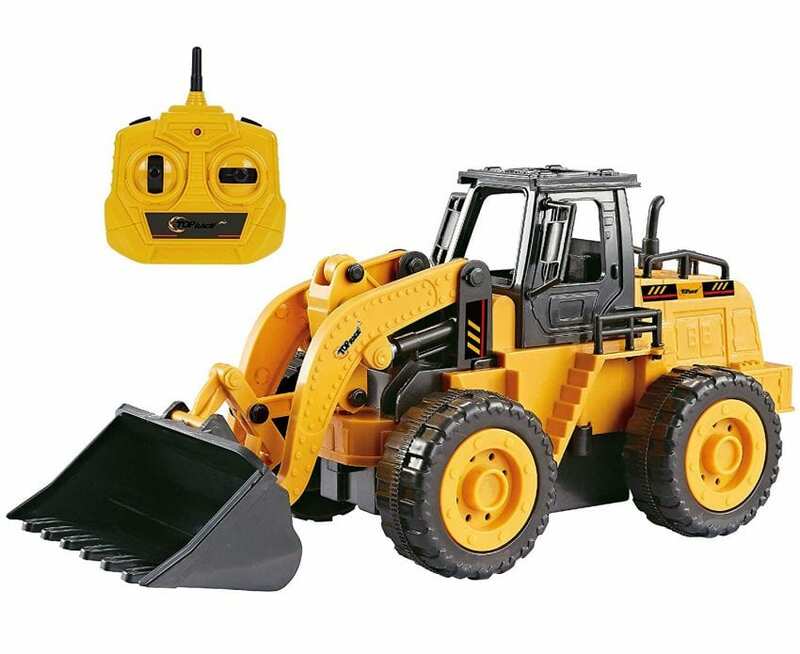 To make it work, it comes with a rechargeable battery of 4.8V 800 mAh with a charger of 9V 200mA; and you can play for hours with this RC construction equipment. Also, it requires 6AA batteries, sadly not there. One thing more which makes this RC model more special is the 1/14 scale replica of CAT Wheel log loader. At last, RC construction equipment isn’t complete without any crane. So, here we have RC Crane which is 1:12 RTR of Premium Label Crawler Crane. It comes with 2.4 GHz speed control and hidden antenna for making additional realism. It comes with a working platform that holds full 360-degree rotation; also it comes with fully digital proportional control. The boom of RC Crane can raise around 20 degrees, and its chassis comes with individual track control to increase handling. So, this makes RC crane immune to flat surfaces and rough terrain. Individual who really love realistic RC vehicles must know the correct place to buy them. Because buying from trusted source serve you with an original product; it makes you feel like you are driving the real RC vehicle. One more thing, you should always analyze various models with various functional parts (such as hydraulics and buckets) and different build-ups. 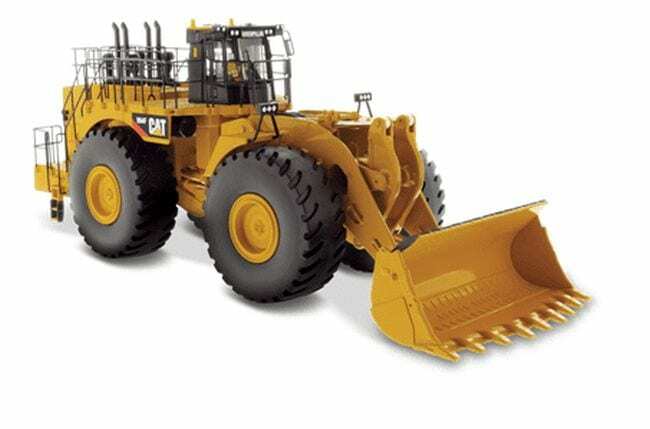 Before availing the RC vehicles, first compare its specs, for example, the best wheel loader comes with large front-end tier just like a loader. It gives a realistic look and unique back arm that supports rotation of 680-degrees and move in all directions. Also, it is essential that the model must have sound and lighting; and completely functional for off roads or muddy areas. 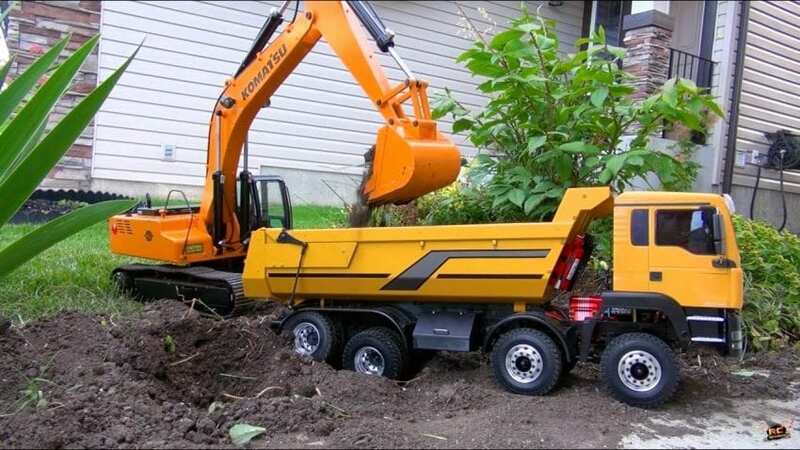 A hobby buyer must go for ultra-realistic RC construction toys. So, carefully make notes of the features like scale, full hand remote control for using lifting function upwards and downwards, also driving forward and reverse. Also, it is necessary that there must be Knobby tiers that provide little off-road movements. Moreover, all the techniques such as lifting, picking up and loading. Must contribute towards an extremely realistic view of the RC construction equipment. You can either select budget-friendly or high-end RC construction equipment. Both versions will provide you a good amount of fun and enjoyment. Also, the flexibility in these machines are incredible, and the number of RC construction equipment will help you to secure more fun for yourself. Gather a number of RC construction equipment and start your own company in your backyard. So, if you don’t have a construction company in real life- no worries. Nobody is going to stop you from playing in your backyard with replicas of real construction equipment. Next articleResidential Solar Installations Are Thriving in the U.S.